U.S. equity futures jumped higher on Tuesday, rebounding from a recent slide on worries about U.S. and European economic growth. Traders had been rattled by a drop in long-term bond yields, which many see as a warning sign of a possible recession. Dow Jones futures were rising by 0.5 percent. The S&P 500 added 0.5 percent and the Nasdaq Composite was up 0.5 percent. Apple announced plans on Monday to launch a subscription TV service. The company did not say how much Apple TV Plus, which will be ad-free, will cost or when exactly it will debut. It will compete with big streaming services including Netflix and Amazon Video. Shares of Bed, Bath & Beyond jumped as Legion Partners Asset Management, Macellum Advisors and Ancora Advisors are preparing to launch a proxy fight to replace its entire 12-person board, according to the Wall Street Journal. Combined they have a 5 percent stake in the company. In Europe, London’s FTSE rose 0.3 percent, Germany’s DAX added 0.2 percent and France’s CAC was up 0.6 percent. In Asia on Tuesday, China’s Shanghai Composite declined 1.5 percent, Hong Kong’s Hang Seng was 0.1 percent higher and Japan’s Nikkei gained 2.2 percent. U.S. stocks, after a broad retreat on Friday, ended trading on Monday largely unchanged. 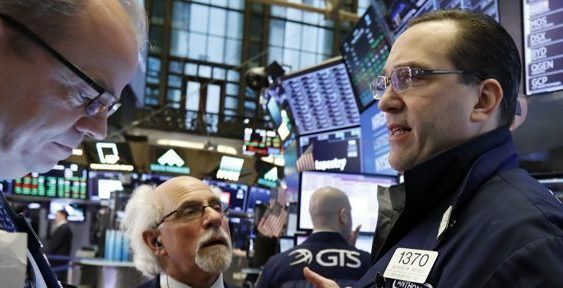 The blue-chip Dow Jones Industrial Average closed up 14.51 points, while the broader S&P 500 and Nasdaq ended with slight decreases. Monday’s performances came amid a lull in news on the tariff war between the Beijing and Washington. China-U.S. trade talks are due to resume Thursday in Beijing.